Time to Retro your '05-'14 Ford Mustang with this awesome Hood, Side and Rear Deck Lid "BOSS 302" style Graphics kit. Graphic design consists of a wide center hood stripe with accompanying highlight stripes with pinstripe at each side that drapes down the front fender and pulls to the rear like the original BOSS 302 style graphics. They're PRECUT and ready to install in a wide variety of colors with very little trimming required (please see installation instructions)! Kit fits models as shown in Application Chart below. Choose from a Solid kit as shown or customize the Front Fender pieces with unique wording where the "Boss 302" is normally placed. Simply enter the Custom Wording of your choice (up to seven  letters/digits/spaces) and we'll make it happen. Either way it'll look Terrific! This stripe package consists of prefitted and contoured pieces made specifically for the '05-'14 Ford Mustang as shown in the illustration and will not fit any other vehicle. Graphic package includes online application and care instructions. of the Lid - under the Spoiler. 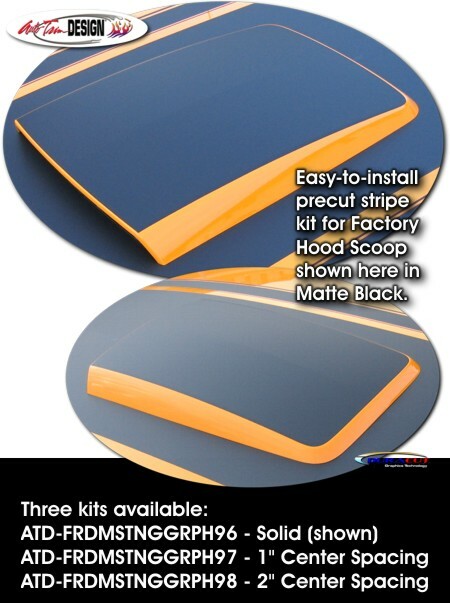 Due to the size and shape of '10-'12 factory Hood Scoops, an optional graphic adaptation kit is not available. Trimmable one (1) piece Hood Scoop Kit (ATD-FRDMSTNGGRPH121) consists of one (1) 21" x 29" (53.34cm x 73.66cm) piece that can be hand trimmed for most after-market hood scoop applications. Graphic kit includes precut piece for the top of the Spoiler shown in the image. If your vehicle has a different spoiler than that shown, simply select the appropriate spoiler in the associated drop-down selection. The "Trimmable" one (1) piece Spoiler Kit (ATD-FRDMSTNGGRPH214) includes one (1) 60"x 16" (152.40cm x 40.64cm) piece that can be hand trimmed for custom spoiler applications.